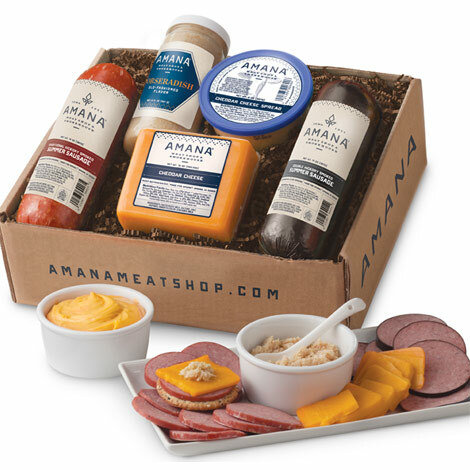 Packed with an assortment of our most popular meats and cheeses, the Amana Dutch Lunch is an all-time favorite for many gift recipients. This proven pleaser makes a memorable gift that is sure to be appreciated. Was totally enjoyed by the recipient! Best horseradish sauce also! Spectacular fix on missing order to Florida. Send another order. No questions asked. Love Amana and Iowa. My sister will have a merry Amana Christmas watching football with Amana snacks. Happy Holidays Amana! This was such a good deal that we could not pass it up. This was a great package deal and we are enjoying every bit of it. My husband loves the Horseradish. The cheese is great and the summer sausage is fantastic. We have ordered just about every package deal you have sent to us by email. We just love your products. Thank you. The order was a gift. The ordering experience was wonderful and the package was sent the same day. UPS left the pkg in a puddle of water! But packaging was such that nothing was harmed. Will use Amana Meatshop again, no hesitation. Recipient loved the gift. Everything in this is Simply Great !!! Thoroughly Enjoyed it !!! 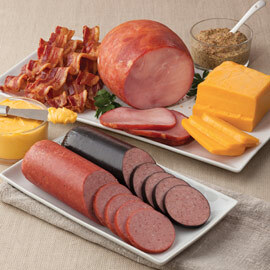 Amana Meat is the best! It was shipped and delivered when they told us it would happen. Well Done! Great customer service. Easy to order online. Product arrived as promised. The lunch basket I ordered was a gift for my son. He had it gone the same day he received it. Shared it with friends who all raved about it. Will order again! Amana Response: Thanks so much, Connie! We look forward to providing those Amana goodies to you, family and friends in the future! The Dutch Lunch gift box makes a great gift for my husband's team at work. They look forward to it every year. Strongly recommend!!! I get this for someone at least once a year. High quality products and great service. I ordered the package of two sausage one smoked and one doubled smoked with the cheddar and cheese spread. A big hit on my buffet table. Loving the leftovers with all the games on tv. First time purchaser and had just a wonderful experience with the website, ordering and the product came on time and in good condition. And then we opened the box and it was even better!!! Great products and perfect for a picnic or for snacking around the house. The horseradish was terrific!!! Will be coming to Amana this summer and will be stopping by. Thanks so much!! Amana Response: Thank you for your nice comments! We look forward to your visit to Amana! Very nice Christmas gift! And delivered promptly! Arrived on time at a great price! I placed my order on a Wednesday, Vickie called that afternoon to clear up the address/zip...she was SO helpful and I am very appreciative that she caught my error. My package was delivered THAT Friday afternoon...amazing. Arrived on time and the recipient was pleased! 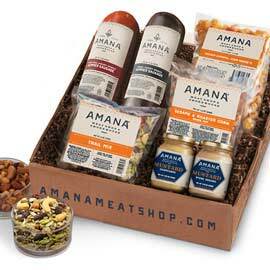 We ordered the gift boxes from the Amana Meat Shop for client Christmas gifts. It was a very large order and we were a little nervous about timing. Everything came on time and perfect. It was a big hit for Christmas! Excellent customer service too! 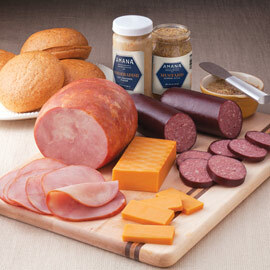 We had an overall wonderful experience with Amana Meat Shop! We will be using them again and again!!! Our smoked summer sausages are ready to be enjoyed. Just slice thin and serve together with cheese or cheddar cheese spread and crackers. Top with a dollop of horseradish for added zing! Refrigerate after opening.